UK, 1954, 84 minutes, Black and white. Margaret Rutherford, Ronald Shiner, A.E. Matthews, Fay Compton, Nigel Stock, Jill Bennett, Reginald Beckwith, Raymond Huntley. 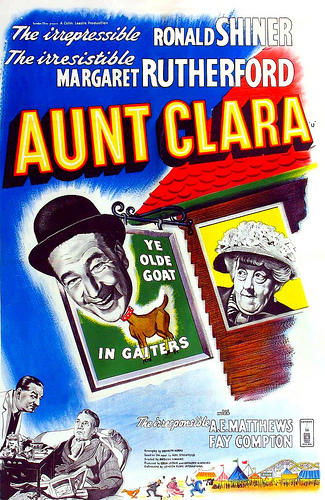 Aunt Clara is a brief serious comedy. It is a star vehicle for Ronald Shiner, popular in the '50s, often in rather raucous movies about the armed forces. It is also a star vehicle for Margaret Rutherford, very popular during the '50s and '60s - always doing variations on her role as a likeable fussy old lady (with a guest appearance by her husband Springer Davis). A young Jill Bennett appears and some veteran character actors perform supporting roles - Fay Compton, Raymond Huntley. The film is somewhat more frank than one might have expected from a British comedy in the '50s - especially towards the end with a sequence concerning a brothel. Aunt Clara is a fine example of British understanding, tolerance and compassion. The film was directed by Anthony Kimmins (The Optimists). 1. British film of the '50s? Serious? Comic? 2. The stars, their screen personas? Audiences enjoying these styles? The British cast? Black and white photography, score? 3. The title and the focus? The opening with Uncle Simon, the pampered old man, his gambling, reliance on Harry, mischievous about his birthday, inviting all the relatives, their greedy hopes, enjoying the banquet, his will - and his death? 4. The portrait of the relatives: the clergyman and his greediness (and then putting on the Roman collar)? Sanctimonious and the Grace? The rest of the relatives, their complaints about the holidays? Greedy and turning up to the meal? The celebration? The photo? The reading of the will and their disappointment? 5. Aunt Clara, Margaret Rutherford's style? With the children, concerned about children looking after others? The reasons for her inheriting everything? Her fussiness, asking Harry to stay? Looking into the situations, searching out Julie, fostering her relationship with Charles? Her going to the Masons, their double-talk, the hotel, the guests? The man with the dogs? The man with the gambling wheel? Her naivety, shrewdness? Her going to Gladys and her response to the madam and the brothel? Her own illness? Enjoying life, helping everyone? The concert and the appeal for the children? Her death? Harry saying there should be more like Aunt Clara? 6. Harry, in the world of men, looking after Uncle Simon? The gambling, the letters? The will? The bequests, his wanting to leave? Helping Clara? Trying to keep her out of trouble, covering up, the sideshows, the races, the brothel? His attack on Julie, change of heart? Appreciation of Clara? The bequest and his getting the pub? 7. Charles and Julie, Julie and the natural daughter situation, the Masons and their taking her money, cruelty, molesting her? Her departure? Bad name with Harry? Attractive, work, at the funeral, her meeting Charles, the bequest, angry with Charles, Clara reconciling them? The wedding? 8. The people that Clara helped: the man with the wheel - and his arrest, Clara's arrest? The Masons, two-timing, covering up, exposed? The brothel and the women, the sympathetic madam, her talk with Clara, recognising her illness, the bequest? The man with the greyhounds, the covering up, the betting, cheating, Clara giving the dog sausages, betting on the alternate dog, giving the money to Harry? The children, the concert? 9. A mixture of the serious and the comic, the stereotype and the frank insight?